Different durations in hours, days, weeks, months and years are represented using Japanese numbers over here. Similar to what you have learned in how to give time in Japanese, in order to tell the correct durations of time, you just need to append the appropriate words to the numbers. 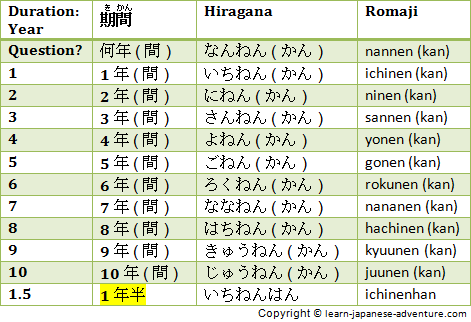 To give the durations of hours, append 時間 (jikan) to the numbers. To give the durations of days, append 間 (kan) to the numbers. But the attachment of 間 (kan) is optional for durations of days. Take note that the Japanese numbers used here follow the days of the month in Japanese. For durations greater than 10 days, attachment of 間 (kan) is not required. You just need to follow the numbers as in days of the month. 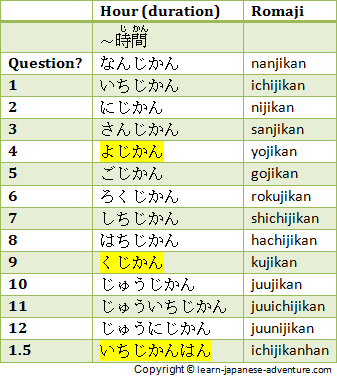 To tell the durations of weeks, append 週間 (shuukan) to the numbers. And to tell the durations of months, append 月 (getsu) to the numbers. Finally, to give the durations of years, append 年間 (nenkan) to the numbers. Again, the attachment of 間 (kan) is optional for durations of years. 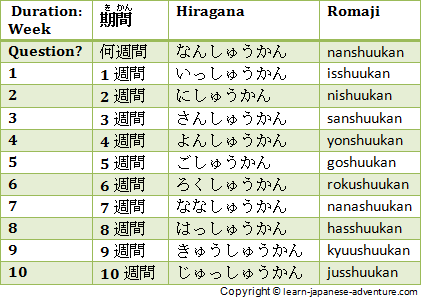 The table below shows the Japanese durations in hours. Take note of the different pronunciations required for the highlighted hours. Four hours are pronounced as よじかん (yojikan), not よんじかん (yonjikan). Nine hours are pronounced as くじかん (kujikan), not きゅうじかん (kyuujikan). We normally say いちじかんはん (ichijikanhan) for one and a half hours, instead of いちじかんさんじゅっぷん (ichijikan sanjuppun). 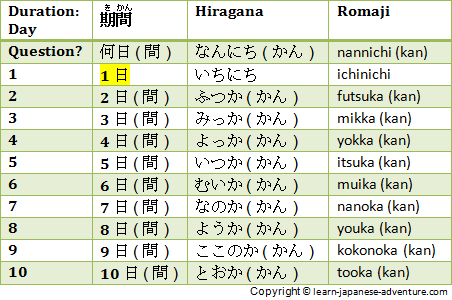 The table above shows the Japanese durations in days. For the duration of one day, use the word いちにち (ichinichi) without the 間 (kan) attached at the end. For the rest of the days, the attachment of 間 (kan) is optional. 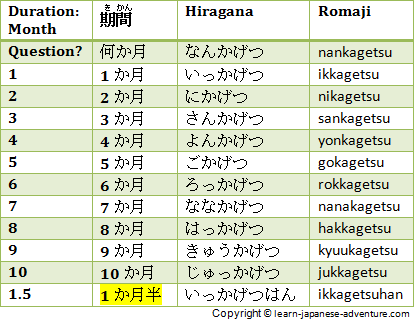 The table above shows the Japanese durations in months. You need to attach the word 半 (han) at the end to indicate half a month. The table above shows the Japanese durations in years. You need to attach the word 半 (han) at the end to indicate half a year. Most of the time, the attachment of 間 (kan) at the end is optional.